Apple today introduced the new iPod touch, featuring Apple‚Äôs revolutionary multi-touch user interface. First introduced on iPhone, the multi-touch interface uses pioneering new software to present a different user interface for each application. the new iTunes Wi-Fi Music Store lets users wirelessly browse, preview and buy songs and albums. The iPod touch is 8 mm thick, and is priced starting at $299. We’re wondering why it doesn’t have Google Maps, Stocks, Notes & Weather. With its 3.5-inch widescreen display, iPod touch is perfect for watching movies and TV shows, as well as viewing photos and album art. iPod touch has a built-in accelerometer that automatically senses when you rotate it into its landscape position. When you‚Äôre in music, it automatically switches to Cover Flow so you can browse your music collection by album cover artwork with just a flick of a finger. When in Photos, it automatically displays the photo in its landscape aspect ratio; and when in Safari it displays the web page horizontally. iPod touch also has a built-in ambient light sensor that automatically adjusts the display‚Äôs brightness. iPod touch features up to 22 hours of audio playback and up to five hours of video playback. The iTunes Wi-Fi Music Store lets you browse the iTunes Top Ten lists of songs and albums overall or by genre, check out new releases and ‚ÄúWhat‚Äôs Hot,‚Äù or search for your favorite songs, albums or artists. You can preview any song for free, then purchase and download the ones you like directly onto your iPod touch over Wi-Fi. The music you download will be automatically uploaded into your iTunes library the next time you sync your iPod touch with your computer. With Safari, the most advanced web browser ever on a portable device, you can see web pages the way they were meant to be seen, with the ability to zoom into any webpage with a tap of your finger. The Safari web browser includes built-in Google Search and Yahoo! oneSearch so you can quickly and easily find information you need. iPod touch also includes Apple‚Äôs incredible YouTube application that allows you to access, browse and search for millions of free YouTube videos over Wi-Fi. Apple today also announced an exclusive agreement with Starbucks that allows you to access the iTunes Wi-Fi Music Store for free in participating US Starbucks stores starting next month. When you enter a participating Starbucks location, your iPod touch, iPhone, or PC or Mac running iTunes will automatically recognize the iTunes Wi-Fi Music Store. You can see what song is currently playing or has recently played in the store, and immediately preview, buy and download it over Wi-Fi. The iPod is the world‚Äôs most popular family of digital music players with over 100 million sold. Today, Apple released its most exciting iPod lineup ever with the iPod shuffle in five new colors; iPod classic holding up to 40,000 songs; the incredible all new iPod nano with video playback; and the breakthrough iPod touch with a revolutionary multi-touch user interface. iPod owners can choose from a vast ecosystem of accessories with over 4,000 products made specifically for the iPod including cases, fitness accessories, speaker systems and iPod connectivity in over 70 percent of US automobiles. The iPod touch is scheduled to be available later this month. The 8GB iPod touch model is $299 (US) and the 16GB iPod model is $399 (US). 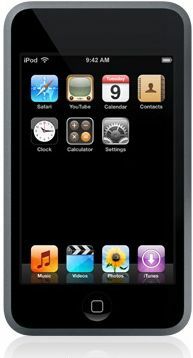 iPod touch requires a Mac with a USB 2.0 port, Mac OS X 10.4.10 or later and iTunes 7.4; or a Windows PC with a USB 2.0 port and Windows Vista or Windows XP Home or Professional (Service Pack 2) or later and iTunes 7.4. Internet access is required and a broadband connection is recommended, fees may apply. The iTunes Store is not available in all countries. I read in your column: “We‚Äôre wondering why it doesn‚Äôt have Google Maps, Stocks, Notes & Weather”. Even mail functionality should be available on such a Wi-Fi device!!! I would also like to be able to look at PDF files (at least PDF files!!) stored on the flash drive…why is it possible to view PDF files as email attachments on the iPhone and why is it impossible to view them if you sync from you computer?? ?